In soccer goals are what you need to win games, so knowing how to attack in soccer is imperative to your team seeing success. This drill teaches a basic but reliable build up into a quality attack. - This should increase your soccer goals totals! Set up a diamond of cones on the right and left side of the field, right back, right mid, center mid, and striker would likely be in a game when the ball is on that side, same for left side. - Have one player begin in each spot, with extra players behind where balls begin at player A spot. - As always, demonstrate how you desire the drill completed, show your players how to check away to create space, show for the ball, call for the ball, and to make quality passes. 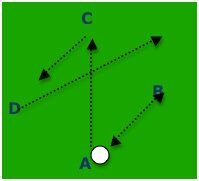 - A passes to B, B passes back to A, A passes to C, C passes to D, D passes into space down the sideline to B, B attacks down sideline and crosses ball into B+C running into the box. - As in a game, right back passes to right mid, right mid passes to right back, right back passes to striker, striker lays off to center mid, center mid passes wide to right mid, who cross into attacking center mid and striker. - Upon completion, the left side proceeds, and each player on the right side rotates one spot up (A to B to C to D). - Players must "check away" prior to showing for a pass. This means they make a short, 3-5 yard run away from the ball to pull a defender away in a game, and to create space. DON'T allow players to stand still waiting for the pass. - All players should on their toes and ready to make a run. - Passes should be 1 touch, players should be communicating. - Passes and runs should be made at high pace, game speed. - Add a "passive" defender in each spot, they don't win the ball but provide pressure to ensure proper runs made. - Allow defenders to win the ball. - No defenders in diamond, but insert 1-2 defenders in box to defend against incoming attacking runs. - 7-10 minutes for this pass and shoot combo.